Vegan Champagne Cheesecake - easy, no-bake, and cashew-free! Vegan Champagne Cheesecake comin’ at ya HOT! Or rather, cold, because this easy celebratory dessert is no-bake and therefore no-fuss and therefore awesome. Combining the killer flavors of a classic cheesecake and a glass of bubbly, these decadent little desserts are the perfect way to turn any ordinary dinner into a celebration of delicious proportions! I love champagne. I love drinking it, opening it, holding the elegant glass in my hand whilst I stare at the little bubbles doing their bubbly thing. It is beyond a shadow of a doubt, my favorite beverage AND my favorite way to celebrate literally anything. And now, I can add cooking with it to that list! Because holy mother of all things delicious, how did I not think of this sooner?! Now, if you’ve been following us for any length of time, you already know how much we looove infusing our dishes with booze. From our crazy-delicious beer cheese soup to our award-winning boozy bac’n mac & cheese, nothing says “fun” quite like adding a bit of liquor to your dinner. Or in this case, dessert! So, when I realized it’s totally possible to apply that same logic to my favorite beverage, my mind went wild with the possibilities. I had been wanting to adapt our cream cheese recipe to make a cheesecake for a looong time. When these two ideas collided, I was 100% sold. Okay, let’s talk ingredients. This vegan champagne cheesecake requires only seven simple, easy-to-find ingredients and about 10 minutes of active time. And that’s calculated whilst leisurely sipping on a glass of champagne which is highly encouraged. After pressing the water out of your tofu, you’ll add it to your food processor with some refined coconut oil (the secret to achieving a firmer cheesecake texture), powdered sugar, lemon juice, vanilla, sea salt, and yes – champagne! Process that stuff until the oil emulsifies and the mixture goes from rough and kinda weirdly “chunky” looking (sorry, could not find a better word) to smooth and luscious and shiny AF. That’s when you know it’s ready! Next, you’ll pour this delectable mixture into your pie crust. You have a few options here: We used these adorable pre-made mini graham cracker crusts that happen to be accidentally vegan. Sooo many pie crusts at your local grocery store are also vegan, but the graham cracker crusts sometimes contain honey so read your ingredients. You can use one large crust if that’s more your style. You can also make your own at home! Another option would be to line a muffin tin with some plastic wrap and make crust-less cheesecakes. 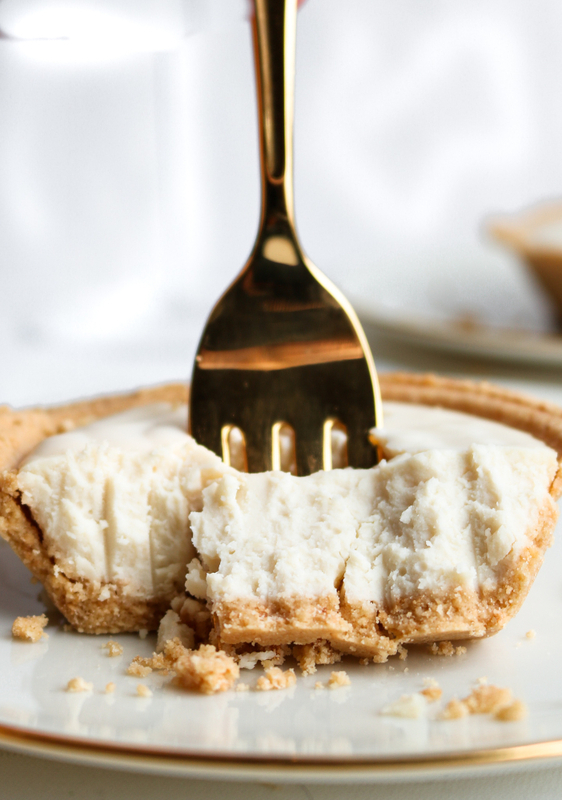 You cannot go wrong with this vegan champagne cheesecake on your side! Once your filling is all settled in your crusts, place ’em in the fridge for about 2 hours (or overnight for best results) to let that coconut oil work its magic. The result will be perfectly firm, delicious, champagne-infused dessert that will knock your socks off! And for those of you wondering, YES! You can totally taste the champagne in these vegan champagne cheesecakes. They pair perfectly with a glass of bubbly and some fresh strawberries or topped with cherry pie filling! I totally cannot take credit for that idea though; it was allll T! Leave it to him to incorporate healthy fruits into any dessert, lol! But I didn’t even mind because this is amazing and totally next-level. Give this vegan cheesecake a try! If you adore the idea of marrying the classic flavor of cheesecake with the celebratory spirit of champagne as much as I do, you have got to try this recipe! It would be the perfect recipe for a date-night-in, birthday, holiday, or congrats-on-making-it-to-Friday celebration. However you make it and whatever you’re celebrating, we’d love to hear what you thought of this recipe! Rate the recipe and leave a comment below, or tag us in your photos on Instagram. 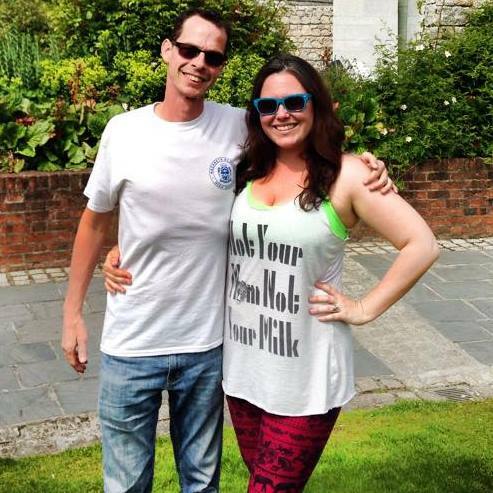 If you’re not already following along, we’re @theplantpowercouple with the “the”. We can’t wait to hear what you think. Cheers! 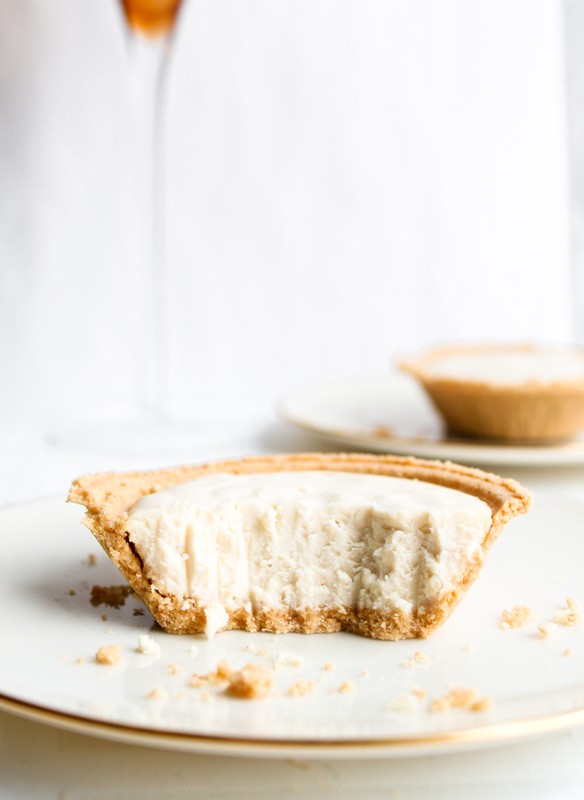 Vegan Champagne Cheesecake comin' at ya HOT...or rather, cold, because this easy celebratory dessert is no-bake and therefore no-fuss and therefore awesome. 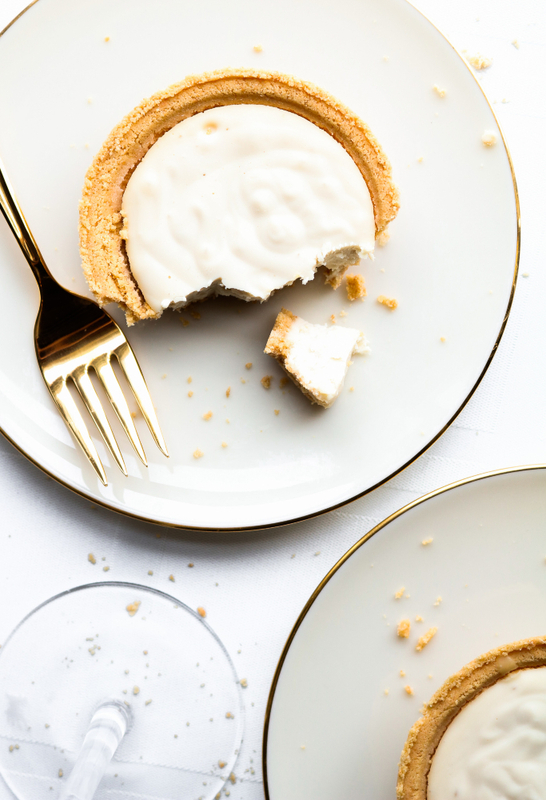 Combining the killer flavors of a classic cheesecake and a glass of bubbly, these decadent little desserts are the perfect way to turn any ordinary dinner into a celebration of delicious proportions! Add all the filling ingredients to your food processor or blender and blend on high for 2-3 minutes, stopping to scrape the sides as needed. You want to blend it long enough for the oil to emulsify; you'll know it's ready when the mixture becomes beautifully smooth and shiny. Pour the filling into your crusts (see notes on crust options) and set them in the fridge for at least 2 hours or overnight to set. Serve with more champagne, strawberries, etc. and ENJOY! *CRUST OPTIONS: We find that a lot of the pre-made graham cracker crusts at our local grocery store are vegan, but be sure to check the ingredients because some contain honey. You can make this recipe gluten-free by using a gluten-free crust. Homemade crust works too, or line a muffin tin with plastic wrap and make crust-less cheesecakes! When did champagne cheesecake become a thing and why didn't I know about this sooner! Love the idea of sipping on a glass of bubbly while I munch my way through these.